Amazing 2+ acre property with 360* views of saguaros, mountains & sunrises! 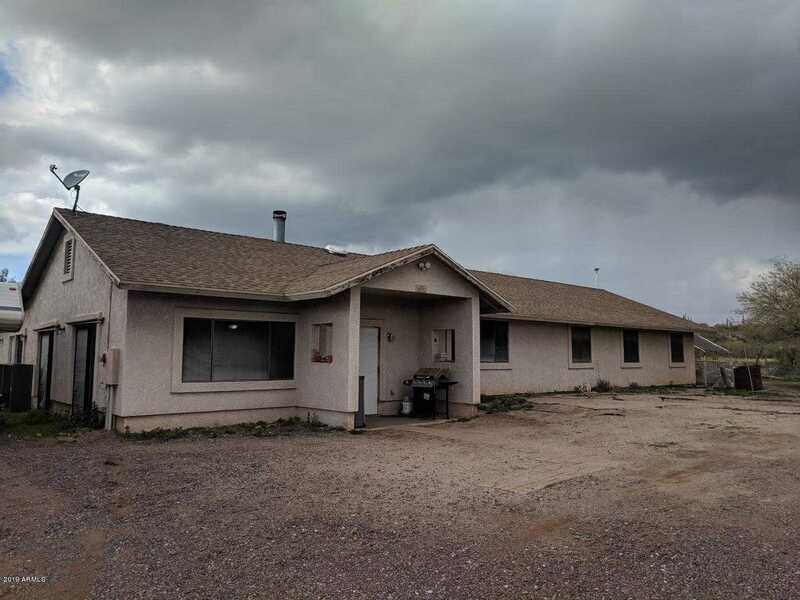 Property being sold as-is, basics are there, 2×6 well built & tons of potential! Enter into lg family room w vaulted ceilings & great fireplace. Then up a few steps to spacious Master, split from others by huge open kitchen w tons of oak cabinets, dbl oven, plenty of counter space & skylights for lots of daylight. Big dining area off kitchen, then down the hall to secondary bdrms & 2nd Master w full bath. Inside laundry room. Great fans t/o. And for every man’s dream… approx. 30×36 garage, insulated, 2 roll up doors, lots of electric. Private well, dog run, very usable 2+ acres just waiting for your toys, horses, ideas and a little TLC. Super easy access to freeway, Anthem and Outlets, 20 min to the lake! Directions: From I17 take New River Rd exit east to stop sign, then north just past New River Rd to first easement on left, west to home. Approximate size: 93044.00 sq. ft.